The flammability, thermal stability and mechanical properties of natural filler reinforced composites were measured using a horizontal burning test, thermo-gravimetric analyzer, and universal testing machine, respectively. The composites were fabricated from epoxy resins and coconut shell particles treated with diammonium phosphate. To improve the flame retardancy of the bio-composites, 5% of Diammonium Phosphates (DAP) were treated into the different weight percentage of coconut shell particles. In general, the results indicate that increasing the weight percentage of coconut shell particles treated with 5% DAP effectively improves the flame resistant, weight loss rate and hardness but decreases the tensile strength and impact strength of the composites. The good linear burning rate and weight loss rate was observed at 30 wt% of coconut shell particles treated with 5% DAP. Flammability; Thermal stability; Mechanical properties; Bio-composite. Synthetic composites that are made from non-degradable polymer and synthetic fiber have an environmental impact on the earth in terms of plastic wastes, carbon dioxide emission when they are burned, and toxic gases that are sometimes released, which contribute to climate change and pollution . Synthetic polymers are made of petroleum-based polymers, for which whereas petroleum resources are finite and require hundreds or thousands of years to be renewed [1,2]. In contrast, natural plastics are made from agricultural products. Natural fibers are also agricultural products and are materially abundant. Both are environmentally friendly, inexpensive and renewable materials. Many studies performed in the field of bio-composites focus on elucidating the mechanical properties, but increasingly consider the fire behaviour of materials in the design of components or structures. The use of composite materials in automotive, ship, aircraft, building interior, and insulation panels, is becoming increasingly important , as is attention to flammability. In fact, 80–90% of composites are used in aircraft and helicopters interior because of weight gains [3,4]. A number of Flame Retardants (FRs) for polymers and composites have been developed, and many of these are suitable for use in fiber composites . Chemicals such as Diammonium Phosphate (DAP) [5,6], Ammonium Polyphosphate (APP) [7,8], Ammonium Polyphosphate with expandable graphite [9,10], Boric Acid with Magnesium Hydroxide , Aluminium Trihydroxide, and Melamine Cyanurate  are added to the molecular structure of thermoset resins or thermoplastics to improve the flame resistance of composites . The flame resistance of polymers or natural fiber polymer composites can be improved by the addition of FRs. The most common method for adding FRs is blending flame retardant filler compounds into a polymer or polymer composite during processing. 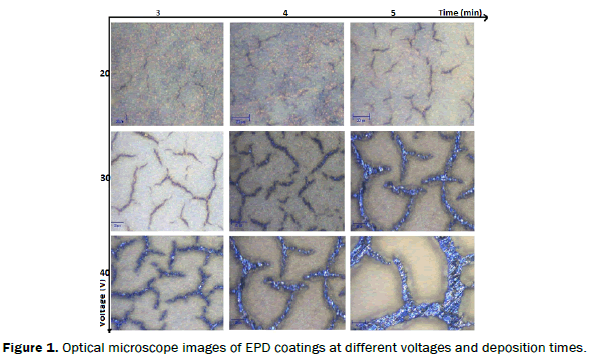 In this study we used epoxy resin as matrix materials, coconut shell particles as filler materials and Diammonium Phosphate (DAP) , as fire retardant to fabricate a composite. The bisphenol A type epoxy resin (CY230) used for this study was purchased from M/s Petro Araldite Pvt. Limited, Chennai, India. Hardener (HY-951) was purchased from M/s CIBATUL Limited, India and coconut shell used in the present investigation was arranged from local market. The coconut shell particles were immersed in DAP solutions with concentrations 5 wt% of DAP. The ratio of coconut shell particles to DAP solution was 1 g particles to 40 ml DAP solution. The mixture was then heated in an oven at 160°C for 1 h. After heating, the coconut shell particles was removed from the DAP solution and directly dried in the oven at 70°C for 15 h.
The treated coconut shell particles at different wt% was completely dissolved in epoxy resin at 100°C using magnetic stirrer with hot plate at a speed of 500 rpm for 1 hour. The epoxy resin and treated coconut shell particles mixtures were kept in still air and allowed to reach 40°C. Next, 10 wt% of polyamide (HY 951) was added and stirred at a speed of 200 rpm for 3 min. Thereafter, the blends were poured in different moulds previously coated with releasing agent. Then the mixture was cured at room temperature for 24 hours. After that, each specimen was cut and polished with sandpaper. Finally, the specimen was postcured at 120°C for 2 h in a mechanical convection oven. The flame retardant properties of the composite were tested in horizontal burning test. The flame was applied to the free end of the specimen for 30 s, and the time required to burn a 75 mm length of each specimen (from the first reference mark until the second reference mark) was determined. Figure 1 shows the relationship among the linear burning rate and wt% of coconut shell particles, weight loss rate and wt% of coconut shell particles treated with DAP and without treated (WT) at 30wt%. It can be seen that as the wt% of coconut shell particles are increased, both linear burning rate and weight loss rate are decreased. At 30 wt% of coconut shell particles treated with 5% DAP solution, gives good linear burning rate and weight loss rate. Above the 30 wt% of coconut shell particles, casting is not possible. This result may be due to the heating of fibers in the DAP solution at 160°C (below the decomposition temperature of cellulose), leading to the formation of phosphoric acid and ammonia. The phosphoric acid formed can phosphorylate the primary hydroxyl group of cellulose to form a phosphorus ester. These esters catalyse the dehydration of cellulose, promoting the formation of char and water at the expense of laevoglucose. Figure 1: Effect of wt% Coconut Shell Particles on Linear Burning and Weight Loss Rate. For Thermal analysis the samples were prepared in powder form by crushing them and the weight of samples were near 10.5 mg and the base material was alumina powder, which was mixed with composite samples in equal amount and medium in which the tests were conducted was air flowing at 20 ml/min. The rate of change of temperature was 10°C/min and range of temperature was room temperature to 1000°C. Data obtained from thermal analysis at different wt% of treated coconut shell particles and untreated 30 wt% of coconut shell particles are given in Table 1. Table 1: TGA and DTG Data of Composites (Under Air Flow, 10°C/Min). The thermal analysis data reveals that the 30 wt% of coconut shell particles had rendered a marginal increase in the thermal stability of composites. The comparison of untreated and DAP-treated 30 wt% of coconut shell particles composites shows that the presence of DAP increases the first and second decomposition temperature. This means that the decomposition rates of DAP-treated coconut shell particles composites are lower than those of untreated coconut shell particles composites. At 500°C, DAP-treated 30 wt% of coconut shell particles composite give more char residue (23.67%) than the untreated 30 wt% of coconut shell particles composite (19.21%) which show that as the decomposition rate decreased, char residue increased. The coconut shell particles have significant effect on the strength, hardness, and impact energy of the composite. From Figure 2(a), it can be seen that the ultimate tensile strength of the composites increase with increase in the weight percentage of coconut shell particles within the matrix of the composite. The epoxy composite with the highest weight fraction of filler (30%) has the highest strength (38.06 MPa) but it is lower than ultimate tensile strength (47.40 MPa) of neat epoxy. On the other hand, percentage elongation of the composite decrease with increase in weight percentage of coconut shells particles due to the fact that the composite becomes harder with the increase in filler content. Figure 2a: Effect of wt% of CSP on Ultimate Tensile Strength and % Elongation. 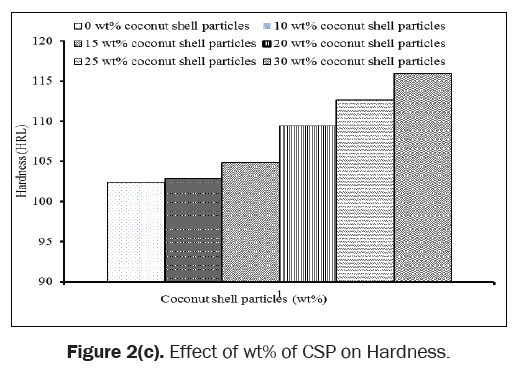 From Figure 2(b), the impact strength of the composite decreases with increase in wt% of coconut shell particles content within the matrix of the epoxy composite. This decrease in the impact properties might be due to the increase in the hardness of coconut shell particles which increase the brittleness of the composite and absorb low impact energy. It can also be seen from SEM micrographs, cavities and brittle cracking decrease the impact strength. Figure 2b: Effect of wt% of CSP on Impact Strength. From Figure 2(c), it can be seen that the hardness of the composite increases with increase in the coconut shell particles content within the matrix of the composite. The sample having the highest coconut shell particles shows the highest hardness value of 115.9 HRL. Figure 2c: Effect of wt% of CSP on Hardness. 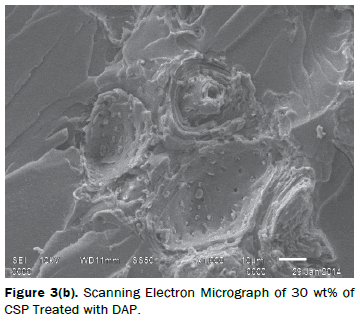 Figure 3(a) shows the Scanning Electron Micrograph of neat epoxy resin and Figure 3(b) shows the Scanning Electron Micrograph of DAP-treated 30 wt% of coconut shell particles. 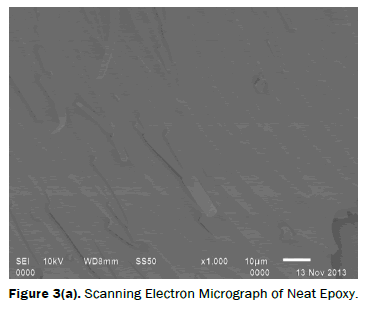 Figure 3a: Scanning Electron Micrograph of Neat Epoxy. Figure 3b: Scanning Electron Micrograph of 30 wt% of CSP Treated with DAP. It can be seen from the Scanning Electron Micrograph results that homogeneity between the coconut shell particles and the matrix decreases with increase in the coconut shell particles content. This explains the decrease in strength with increased in the coconut shell particles content within the matrix structure of the composite. The increase in hardness is as a result of the increase in the weight percentage of the coconut shell particles within matrix materials. DAP-treated coconut shell particles can effectively reduce the flammability of the filled composite. The more the filler content, lower the linear burning rate and weight loss rate. 30 wt% of treated coconut shell particles composite reduce the flammability of the filled composite up to 30% of without treated composite. 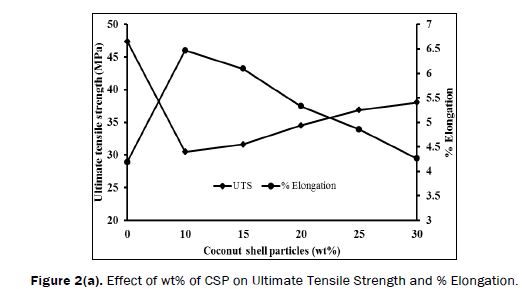 Coconut shell particles improve hardness property of the epoxy matrix composite but reduce ultimate tensile strength, percentage elongation and impact strength. Homogeneity between the coconut shell particles and the matrix decreases with increase in the coconut shell particles percentage. The authors express their gratitude and sincere thanks to Department of Science & Technology (DST), INDIA and Dean, College of Technology, Pantnagar for providing finance to carry out this research work smoothly. Ray SS and Okamoto M. Biodegradable Polylactideand its Nanocomposites: Opening A New Dimension For Plastics And Composites.Macromol Rapid Commun2003; 24: 815–840. Satyanarayana KG, et al. Biodegradable Composites Based on Lingo- Cellulosic Fibers – An Overview.ProgPolymSci2009; 34: 982–1021. Mortaigne B, et al. Fire Behaviour Related to the Thermal Degradation of Unsaturated Polyesters.PolymDegradSta 1999; 64: 443–448. Mouritz AP and Gibson AG. Fire Properties of Polymer Composite Materials. Springer2006, The Netherlands. Chen G.In Situ Thermal Condensation of Glucose –Diammonium Phosphate in Wood for Fire and Fungal Decay Protection. Wood FiberSci 2009; 4: 105–116. Gaan S and Sun G. Effect of Phosphorus Flame-Retardants on Thermo-Oxidative Decomposition of Cotton.PolymDegrad Stab 2007; 92: 968–974. Garcia M, et al. Wood–Plastics Composites with Better Fire Retardancyand Durability Performance. Composite 2009; 40: 1772–1776. Reti C, et al. Flammability Properties of Intumescent PLA including Starch and Lignin, Polymers for Advance Technologies.PolymAdv Techno2008;19: 628–635. Schartel B, et al. Fire Retardancyof Polypropylene/Flax Blends. Polymer 2003; 44: 6241–6250. Hapuarachchi TD, et al. Fire Retardancyof Natural Fibre Reinforced Sheet Moulding Compound.Appl Compos Mater 2007; 14: 251–264. Sain M, et al. Flame Retardant and Mechanical Properties of Natural Fibre–PP Composites containing Magnesium Hydroxide.PolymDegradSta 2004; 83: 363–367. Suardana NPG and Lim JK.Mechanical Properties of Hemp Fibres and Hemp/PP Composites: Effects of Chemical Surface Treatment. Mater PhysMech 2011; 11: 1-8.